To embed this file in your language (if available) use the lang parameter with the appropriate language code, e.g. [[File:Simplified Map of Gor.svg|lang=en]] for the English version. 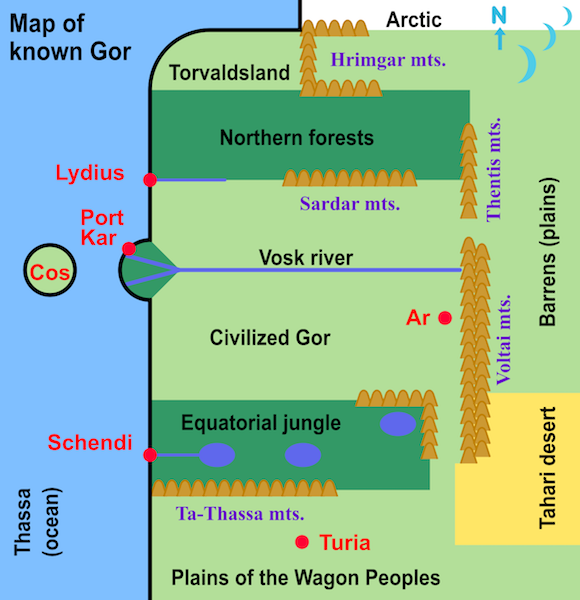 Simplified map of known Gor according to the descriptions in John Norman's Gor series of science fiction novels, showing Thassa (ocean), Torvaldsland, northern forests, Hrimgar mountains, arctic, Lydius, Sardar mountains, Thentis mountains, Cos, Port Kar, Vosk river, Ar, Voltai mountains, Barrens, Schendi, equatorial jungle, Tahari desert, Ta-Thassa mountains, Turia, and the plains of the Wagon Peoples.